You’ve probably noticed by now that my family loves lamb in any shape or form so I’m always on the lookout for new recipes, especially ones that can feed a crowd with minimum fuss. Lamb shanks are always a good choice for large gatherings and this recipe from Jamie Oliver pairs the lamb with lovely Moroccan spices, fresh tomatoes, dried apricots and unusually, baby potatoes. 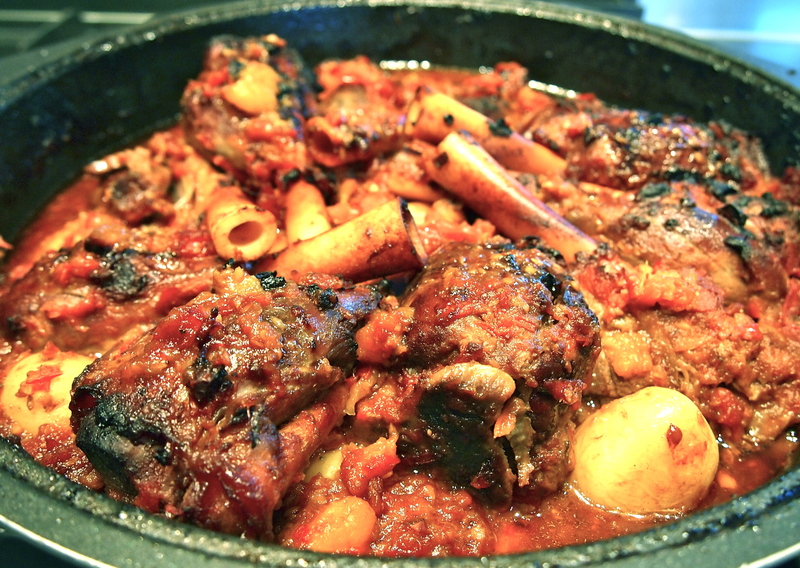 This is a simple meal to whip up but as usual with lamb shanks, long slow braising is required. If you want to make this for a mid week meal you can cook it on the weekend and easily reheat it with the flavours developing as it sits. This meal is made extra easy as the lamb shanks don’t need to be fried before being added to the braise – yay, no messy stove to clean up afterwards! As usual Jamie’s recipes are pretty spot on but I did find that the cooking time of 3 hours wasn’t quite long enough and cooked mine for closer to 4 hours but I really do like my lamb shanks to be literally falling off the bone. 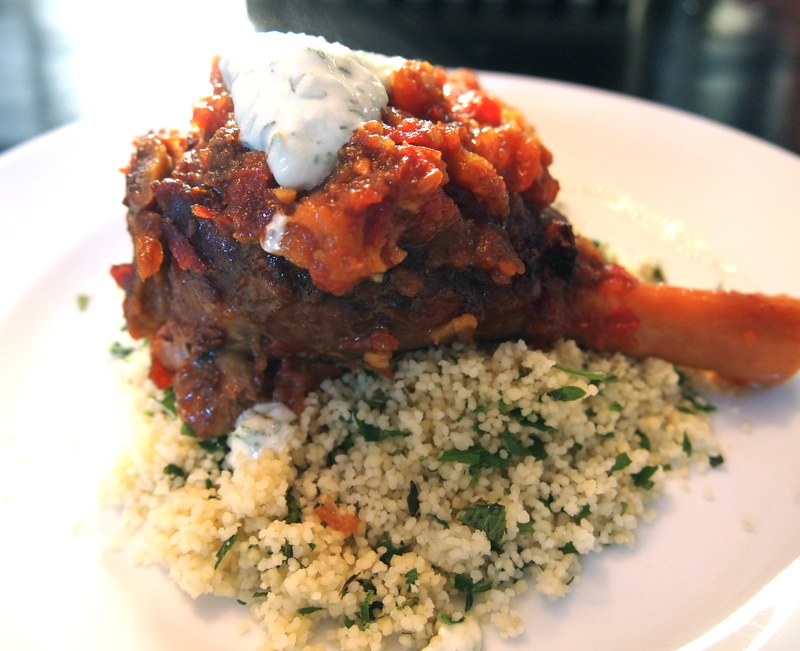 I served this with a simple side of cous cous and the herbed yogurt that’s included in the recipe. Preheat oven to 160C. Season the shanks generously with salt and pepper. Place the onions, garlic and spices into a food processor and blitz into a paste. Heat a large ovenproof pan (you’ll need one with a lid) over medium heat, add a generous splash of oil and the spice paste and fry for about 5 minutes until fragrant. 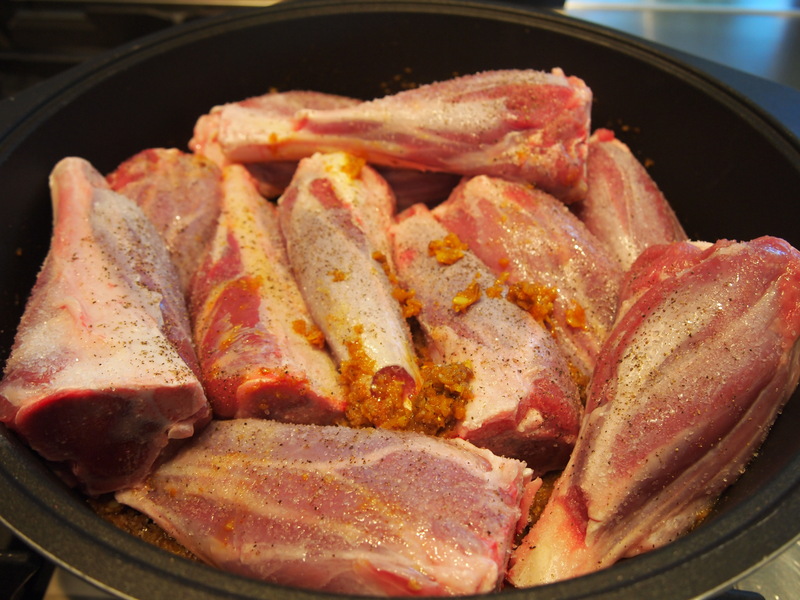 Add your shanks to the spice paste with the bony ends sticking up. Blitz the tomatoes and apricots in a food processor to a thick mixture. Pour this over the shanks, add the potatoes and place on the lid and bake for 2½ – 3 hours, until the shanks are almost falling off the bone, then remove the lid and cook for another 45 minutes – 1 hour. Meanwhile combine the mint and coriander with the yoghurt, and season. Serve bowls of lamb with the tomatoey juices, topped with dollops of herby yoghurt, the toasted flatbread and simple cooked couscous.